The “Drill” Proved the IPAWS Communications Network and Civil Defense Team was No Match for Cyber-warriors at Honolulu’s Booze Allen Hamilton Promoting the Need for AT&T’s “First Net” Emergency Response and Billions of Dollars in State/Federal Appropriations. Honolulu, HI (1-22-18)–One week after the worst breach of civil defense security in history new evidence has emerged, beyond state and federal negligence, that confronts Hawaii officials, according to citizens and investigators attending the “Town Hall Meeting” sponsored by Governor Ige. Unanswered questions and public outrage over officials’ misrepresentations and unnerving “dumbfounding” raises probable cause to re-consider sabotage by cyber-hacking. This report by analysts for the public protection watchdog group, Medical Veritas International, Inc., concludes that “cyber-warfare” best explains how four well-trained staff in the civil defense control room issued the false “INCOMING” alert after repeated “fail safe” prompts cautioned them against the mistake. A supervisor even verified the “button pushing” preceding the deadly 38-minute delay in clearing the false broadcast. And days later, a similar crisis happened in Japan. A new video published by the Medical Veritas non-profit that is concerned about social distress, stress-related illnesses, and at least one death caused by the January 13, 2017 fright—shows concerned “Town Hall Hearing”-goers suffering from “post-traumatic stress disorder.” Investigators objected to FEMA procedure violations; and Space Pearl Harbor co-author, Sherri Kane received applause and smiles from even state senators watching the Governor’s civil defense team being racked over the coals. This independent cyber-crime report on the likely sabotage was sent to leading Hawaii legislators and FEMA officials by Harvard-trained public health expert and media intelligence analyst, Dr. Leonard G. Horowitz. 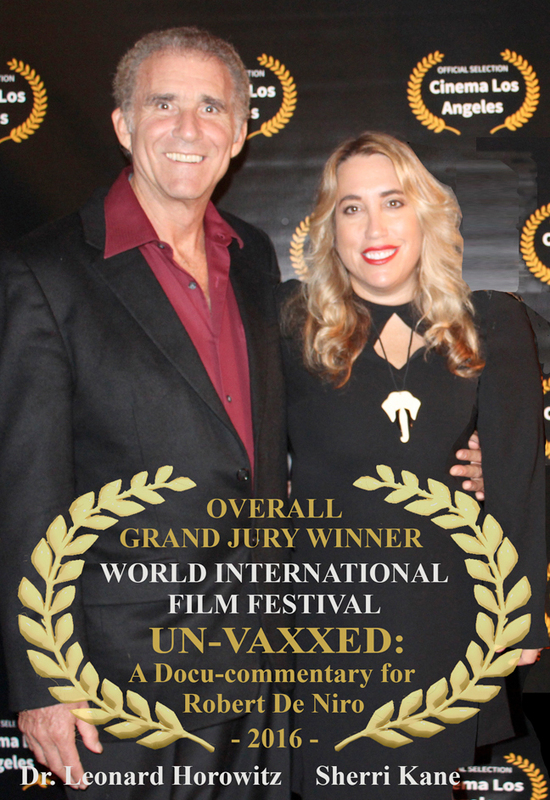 This Editor-in-Chief of Medical Veritas online is best known for his award-winning AIDS research evidencing the pandemic’s laboratory origin and hepatitis B vaccine transmission, and natural medicines featuring 528Hz frequency for DNA repair to combat the illness. 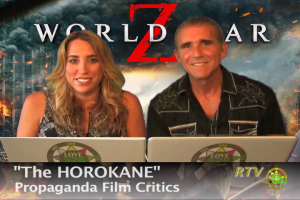 Healthy World News subscribers can click this banner to get a FREE viewing of the outstanding (password protected) 57-minute multi-media video production. Sign up on 528Revolution.com to get your clearance and password now! Hawaii’s civil defense team is led by U.S. Army Retired Maj. General, Vern Miyagi and Maj. Gen. Arthur “Joe” Logan. Gross ignorance of cyber-warfare risks best explains their incompetence. Their blatant misrepresentation of their need for federal involvement in decision-making and correction-issuing caused the delay. And their concealment of the name of the falsely reported single “guy” who “pushed the wrong button” is generally maddening; while his monitored actions were likely sabotaged by cyber-hacking. Could the wrong message have been hacked into the vulnerable system causing the “right button” to broadcast a 38-minute statewide disaster? Nothing explains what happened better, according to growing evidence. Gen. Miyagi incoherently evaded the most important procedural questions clearly phrased by distressed vacationing attorney Mitch Fine. In broken and inaudible English, Miyagi took responsibility for the crisis, but he wasn’t at the operations center at the time. He repeatedly diverted to justify his concealing the name of the single “guy” who has been falsely presumed responsible by the press, contrary to the emerging evidence of cyber-security system sabotage. Investigative journalist Kane dropped Miyagi’s mouth by asking whether the crisis was manufactured to abuse people in a “psychological experiment.” Applause and smiles followed Kane’s reasonable question to Miyagi after the Governor’s point man presented a poll measuring public attitudes requiring persuasion to counter the public’s general disinterest in nuclear preparedness. “I’d like to see what happens to this poll after what we experienced last week,” Miyagi said during his ear-straining mind-boggling forty-minute slide presentation that could not have been more difficult to discern. Officially called “PSYOPS,” short for “psychological operations,” governments generate “polls” to gather intelligence for public persuasion; and when National Security is at stake officials turn to “military neuroscience” to better assess and alter public perceptions and emergency response behaviors said to be critical. The IPAWS warning system appeared to be operating fine. It provided ample opportunity for the four “well-trained” warning officers to stop the wrong message going out. Then there is no reasonable explanation for the excruciatingly-long delay in issuing the corrected message. Precisely! A lot more to it than the superficial reporting victims are receiving. The lack of intelligence within Gov. Ige’s administration is shown by Lt. Col. Charles Anthony, a spokesman for the Hawaii Department of Defense. He told the Huffington Post that it took more than 30 minutes to send a follow-up alert because their system did not have a feature that allowed employees to send follow-up alerts after one is already sent. This evidence leaves any reasonably intelligent investigator to consider the “single button pusher” probably pushed the right button, but was dumbfounded, like the rest of his team, with what happened. The only reasonable explanation here is sabotage. That is, someone with hacking expertise breached the system online, and changed the code to issue the false message when the “right button” was pushed. And given the fact that the same thing happened in Japan, and that there are relatively few agents with this hacking capability operating geo-politically and commercially, the field of suspects is narrow. “They had the same message,” Kane told Miyagi. “So, how could Japan have the same message as Hawaii if it was an ‘accident’?” The government official had no audible answer, and Senator Clarence Nishihara quickly took the microphone from Kane and recessed the session. Kane’s question opened a Pandora’s box of evil. The source of the Japanese alert was NHK. This company specializes in communications technologies for public persuasion. 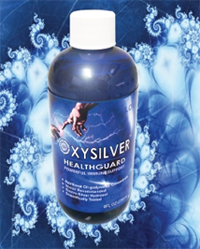 They research and develop spin-off technologies and companies for profit, a ploy learned from U.S. and British universities, although they are protected by the government. NHK works cooperatively with Western intelligence agencies and cyber-security companies likewise. To have the same false unprecedented message go out twice on two far removed continents only days apart gives any reasonably intelligent person probable cause to consider an organized crime featuring cyber-sabotage. And the financial motives for doing so are spelled out on NHK online network of private (for profit) businesses supplying cyber-security services just as nuclear missile threats from North Korea jointly threaten America and Japan. Too convenient a “coincidence” to be dismissed. Compounding the pattern and evidence the U.S. Centers for Disease Control and Prevention (CDC) suddenly, inexplicably, and damagingly cancelled a January 16 meeting that was scheduled to focus on the “Public Health Response to a Nuclear Detonation.” This was correctly interpreted as “the health body responding to heightened rhetoric of nuclear war between the U.S. and North Korea,” said the Washington Times. After six months of planning with FEMA officials to co-host the event, pay for speakers, pay for publicity, and arrange accommodations, the lame excuse given for the cancellation reported on January 12, 2018—one day before the Hawaii crisis—was that the flu was more important. Incredible. 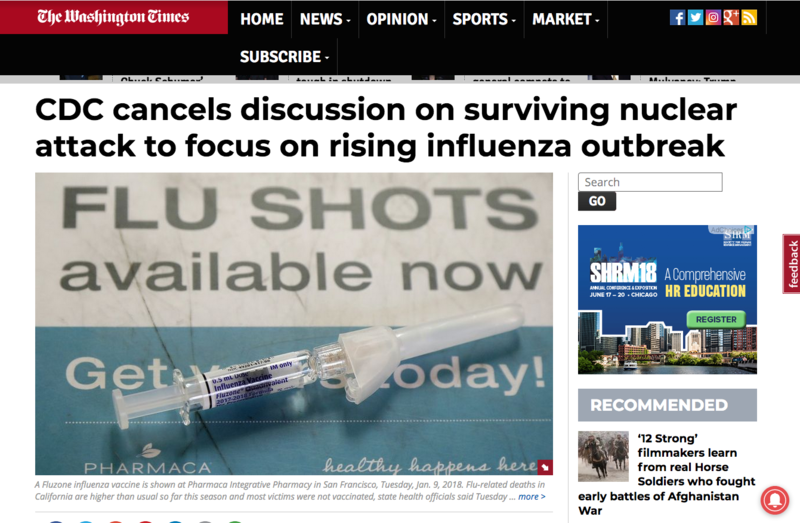 A more reasonable explanation for the flu being more important than a nuclear crisis is the public perception and suspicion that the perfectly-timed federal event would have immediately following the Hawaii “accident” for some concealed conflict-of-interest. And if all the above is not convincing conspiracy enough, NBC showed up at the Hawaii Emergency Management Civil Defense Bunker a few hours before the false alert. The timely appearance tied the CDC’s sudden switch to flu vaccines to the network’s partner, Bill Gates–co-founder of MicroSoft–the “MS” in MSNBC. Gates is a leading depopulation strategist and media persuasion artist. 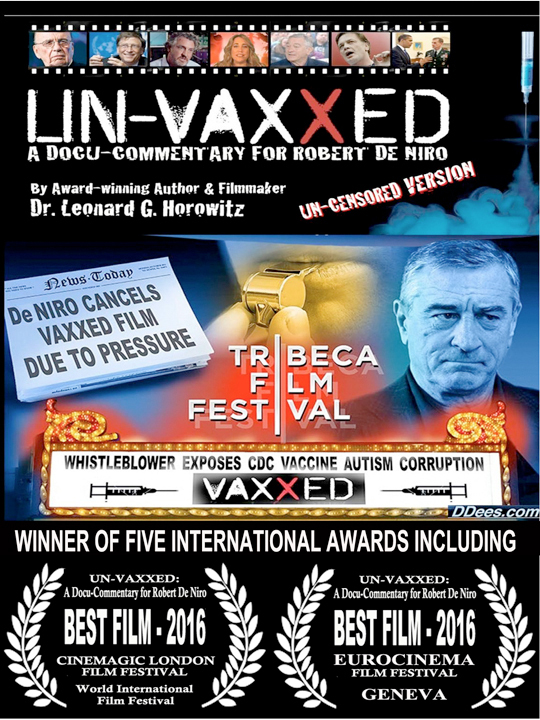 He has repeatedly proclaimed the benefits of vaccines to reduce 15% of the world’s population–approximately 800 million people. 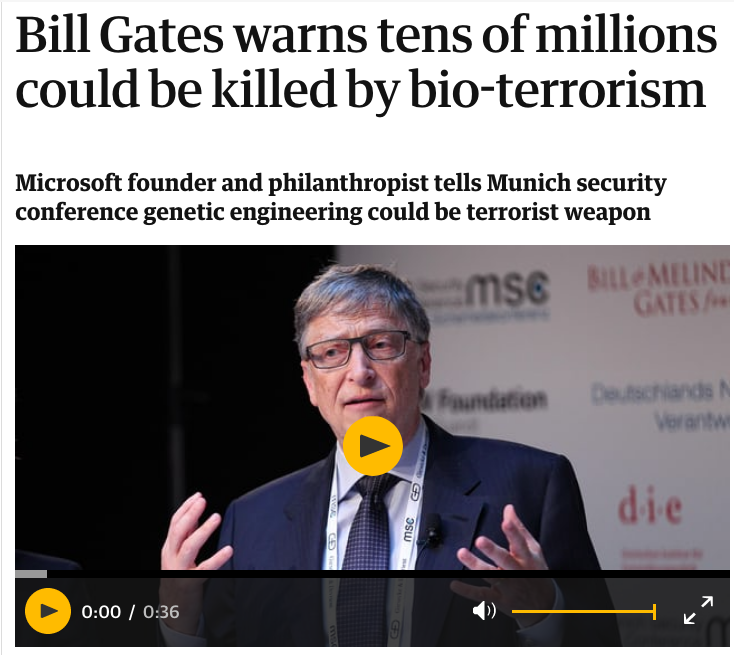 Not only is the Bill and Melinda Gates Foundation leading this charge as the world’s leading vaccine distributor or “bio-hacker,” but the computer pioneer warned only a year ago that bioterrorism is likely to be more deadly than nuclear threats. CNN published this link heralding: “Bill Gates warns the world to prep for bio-terrorism.” CNN was the “news network” banished from Trump’s White House press conferences as punishment for their “FAKE NEWS.” This news source paired this prophetic propaganda with the “Doomsday Clock” announcement about the risks from nuclear weapons being urgent. 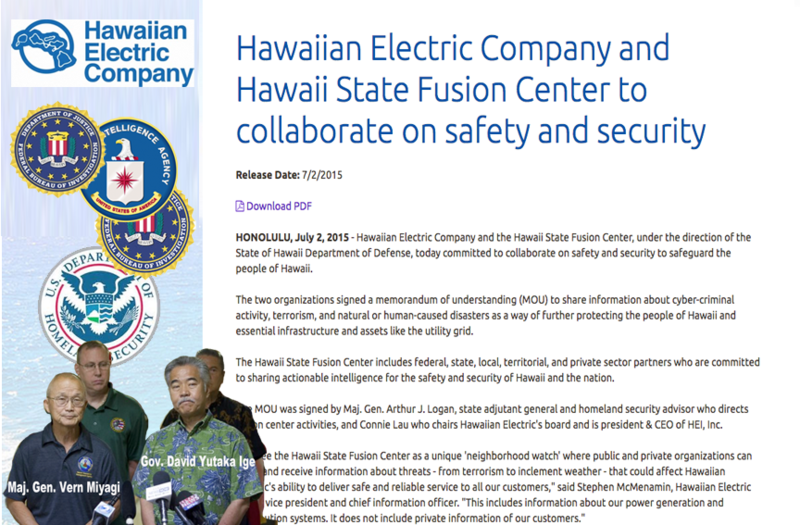 Governor Ige’s administrators are obviously out of their league when it comes to cyber-security, cyber-warfare, or even FEMA warning procedures based on their recent actions. Given information on a need to know basis only in military circles, they apparently have no knowledge of what’s happening across town at Booz Allen Hamilton, or even in their own “Fusion Center’s” intelligence operations supervised by the CIA and DHS in favor of the lucrative world of nuclear cyber-warfare and security systems commerce. “Follow the money” to new contracts for social engineering, marketing, and gaining public acceptance of expensive defense technology, cyber security and warning systems administered through AT&T and its suppliers for stockholders. 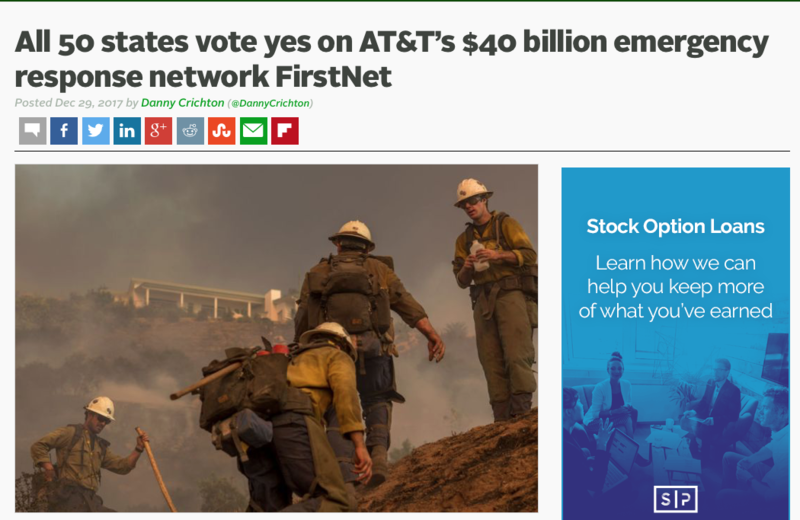 Depending on public support and legislative appropriations, AT&T’s “First Net” profits are expected to far exceed the $40 billion the stockholders invested to control all emergency alerts issued to and through first responders across the United States. 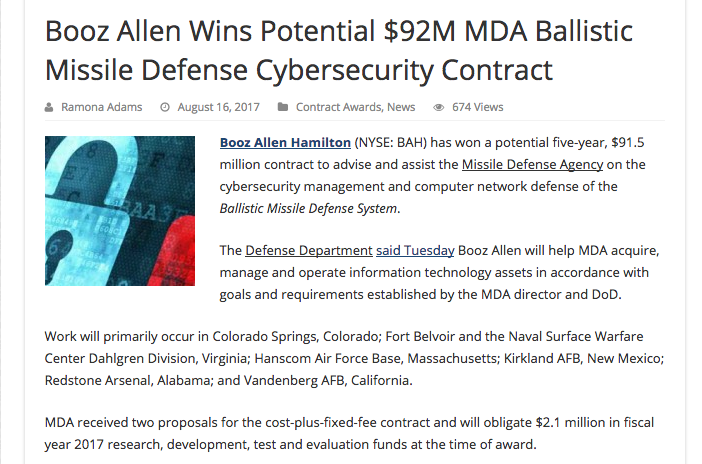 Booz Allen is Pacific headquarters for the American intelligence community and military commerce too (especially in U.S. Navy and National Security enterprises), and private multi-national businesses depend on their intelligence too, each desiring to know precisely what the public and defenders will do in the event of a real incoming ballistic missile. With the same “mistake” made by Japan’s leading behavioral science data collector and propaganda broadcaster, NHK-TV only days later, the military importance of this coordinated “drill” to our Western allies opposing North Korea cannot be under-estimated. But there is something seriously wrong with this picture painted by the press and defense officials in Hawaii. More evidence of an orchestrated PSYOPS. The entire crisis is politically and financially illogical because North Korea is China’s ally, and Chinese companies have heavily invested in Hawaii during the past decade. Korea nuking Oahu would therefore have grossly negative consequences on Korea and China. Neglecting this “elephant under the carpet” in the middle of the “war room” smacks of the magician’s slight-of-hand routine. Look over here at this “INCOMING” missile from N. Korea, but don’t look at Booz Allen’s motive for the sabotage. Most incredible is Miyagi ignorance and neglect of these political and economic realities at Booz impacting the cyber-security equipment his team operates. It is public knowledge that Booz Allen is the firm spawned Edward Snowden. Therefore, Booz’s depth of cyber-crime capability might be suspected if not expected, given the company’s history. You might recall Snowden’s Wikileaked news generated global terror that “Big Brother is Watching You!” That great advertising too sold security systems using fear. That action likewise broadcast the threat globally to generate the lucrative social control meme. 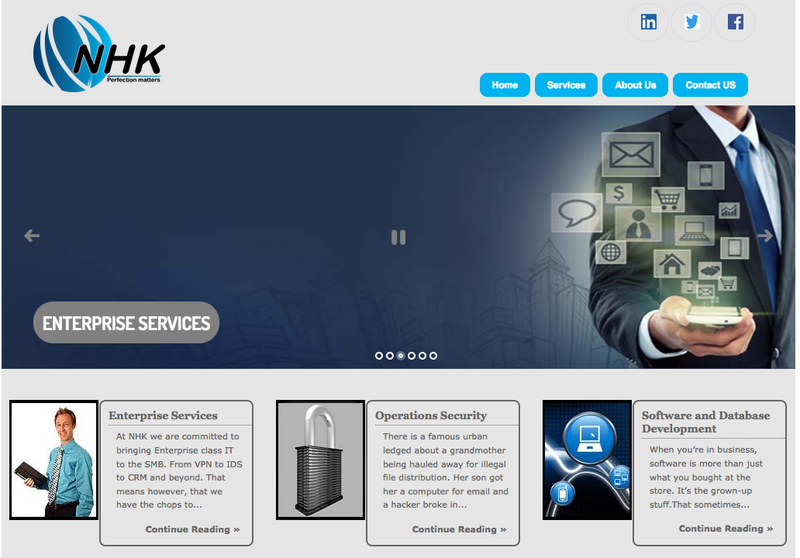 It forced people internationally to purchase all kinds of cyber-security software and equipment. 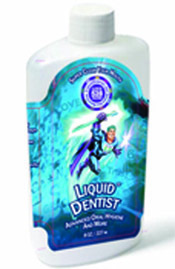 Slick advertising and ingenious marketing don’t you think? This was wonderful for investors holding concealed interests in abusing the intelligence firm’s cyber-capabilities exploding in the market for security systems and military defense. Even more irony is shown physically with Booz Allen operating only a few miles away from where this “Preparedness Meeting” took place, not far from Pearl Harbor where the U.S. Navy awarded Senator Daniel Inouye its Heritage Award for appropriating massive amounts of money to the military. Curiously, Inouye also chaired the Senate Intelligence Committee between 1976 and 1979. Inouye succeeded Idaho Sen. Frank Church directing the Church Committee. That fascinating part of neglected history blew the lid off the CIA’s illegal chemical and biological weapons experiments done on unwitting civilians and military personnel. The CIA’s classic MKULTRA “mind control” program featured propaganda and psycho-active chemicals. LSD, like the modern “DMT,” was opposed Inouye who was nonetheless blackmailed to temper his ethics. Hypocrites! Hawaii’s criminal cartel is out of control victimizing masses of Hawaii citizens, aided-and-abetted by the corrupted courts, bribed legislators, and crooked law enforcers who claim this “Aloha State” is suitable for tourism. Attorney Fine raised the third set of facts justifying citizens’ anger as evidence of cyber-warfare. How so? Crisis capitalism uses public outrage to pursuade legislators to find and fund solutions. Gov. 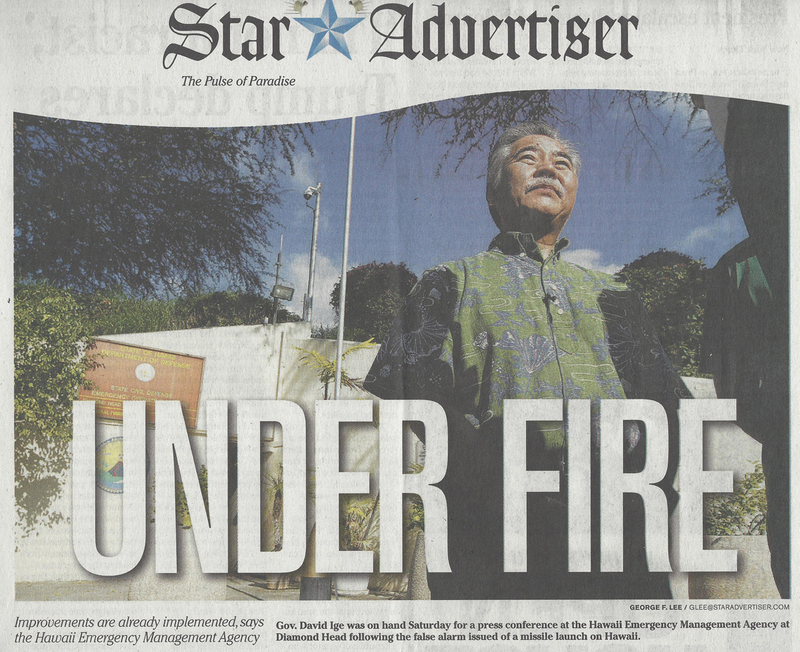 Ige’s administration is so incompetent they were easy targets for this likely sabotage. Don’t forget, the Deep State is selling cyber-security systems and services. By showing how stupid Maj. Gen. Miyagi and Joe Logan can be made to look, the politicians will be moved to replace them. But who will replace them? Booz Allen of course, whose security system experts know best how to interface with AT&T for the successful launch of their First Net system, and then know best how to secure the system against hackers. Tourist Fine announced at the public hearing that the FEMA license granted the state the authority to employ IPAWS procedures detailed in an easy to read follow manual. The e-book especially warned against false alerts referred to as “cry wolfs.” In the system Hawaii installed even if a “mistake” was made, the procedure required to correct the problem, the book explains, did not need federal input, unlike what Miyagi’s team thought. It was that negligence that delayed broadcasting the remedy. 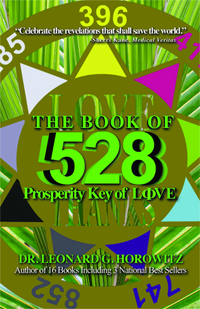 Hawaii, and possibly FEMA officials too, share responsibility and liability for defying the IPAWS procedure book. The instructions empower licensees “to cancel, correct, and re-send the alert” as a public duty to remedy promptly any emergency. But the feds reserve the power to override the system in the event of the State’s inability or a damaging emergency. The IPAWS section 6.3 addresses this question of whether federal agencies intervene when states make mistakes. The manual asks, “Does the project place limitations on re-dissemination?” The answer is “No.” And under exceptional circumstances endangering lives FEMA officials are responsible for intervening and correcting states’ mistakes. Hawaii Emergency Management Agency spokesman Richard Rapoza told the Chicago Tribune following the event that his agency asked FEMA for clarification during the emergency about whether “rescinding an alert was an appropriate use of the warning system.” But that is a ridiculous statement given the express instructions in the IPAWS manual. Rapoza’s action caused more unnecessary delay, and is additional evidence of incompetence and negligence. Rapoza knew, or should have known, the State was authorized to immediately correct the mistake, and the warning system software was set up to immediately do that. “There was no automatic way to send a false alarm cancellation,” Gov. Ige falsely informed the press on Saturday (at 9:05 in his first press conference broadcast). That statement defied the IPAWS procedure book. Governor Ige extended his administration’s lie. “The [new] template will have a pre-scripted message [on it], saying ‘this is a false alarm’, and ‘the missile is not inbound.’” It will go out the same way the initial announcement went out. We didn’t have a process in place. Ige said. No automatic mechanism was in place. By falsely assuring the public this way, Ige vicariously campaigned for AT&T’s First Net deployment arranged only six (6) months earlier. Instead of realizing they had probably been hacked, State officials in “damage-control” mode blamed the single fall “guy” at the switch. Vern Miyagi took the blame personally, as any honorable military team leader would. But that didn’t help getting to the truth and final disposition of the matter. This “honorable” posture, under the circumstances, delays justice, possibly obstructs justice, and leaves citizens/victims in the dark, suspicious, resentful, and distressed. The “fall guy” should come clean. He should be interviewed by the media. If his life is threatened, security should be provided as needed. Only when he publicly explains most candidly what he did, perhaps all correctly, will this matter be defused. The longer the public is made to suffer uncertainties, the greater the distress, social damage, and distrust of government. The State of Hawaii Emergency Operations Plan, (“HI-EOP”), Section 1.1 details the “Relationship to Federal Plans,” and federal duties to citizens during emergencies. “Issuing an emergency proclamation to declare a state of emergency and exercising, as appropriate, emergency authorities . . .
“Providing strategic guidance for state response and recovery operations. . . .
Gov. Ige is accused of irresponsibly delaying sending out a correction because he had delegated his responsibility to his social media officials, and their delays further caused damage. Even worse, the Governor’s subsequent false statements diverted from the aforementioned facts, including false blame directed at the “fall guy” who may have been a hack victim, rather than simply negligent. Under these circumstances of a highly probable cyber-attack committed for financial and political gains, the Governor was responsible for providing strategic guidance for state response and recovery, not “damage controlling” misrepresentations. He was to have investigated the cyber-sabotage possibility thoroughly given the “process of elimination” that dumbfounded his team. Their dumbfounding required them to obtain federal cyber-warfare expertise. A week after the event, no such efforts have been reported by the Governor’s office. Under Section 3.3 of the HI-EOP, officials are to “[e]ngage with federal agencies with responsibilities for Federal Emergency Support Functions (FESFs) to develop and exercise integrated plans and processes that address emergency coordination across all levels of government,” but not delay in an emergency to provide local relief. “During an emergency, the Homeland Security Division is part of the [State Emergency Response Team] SERT and performs functions described in sections 3.4.3 State Emergency Support Functions – Scope and Agency Assignments and 5.2.6 Intelligence Section. 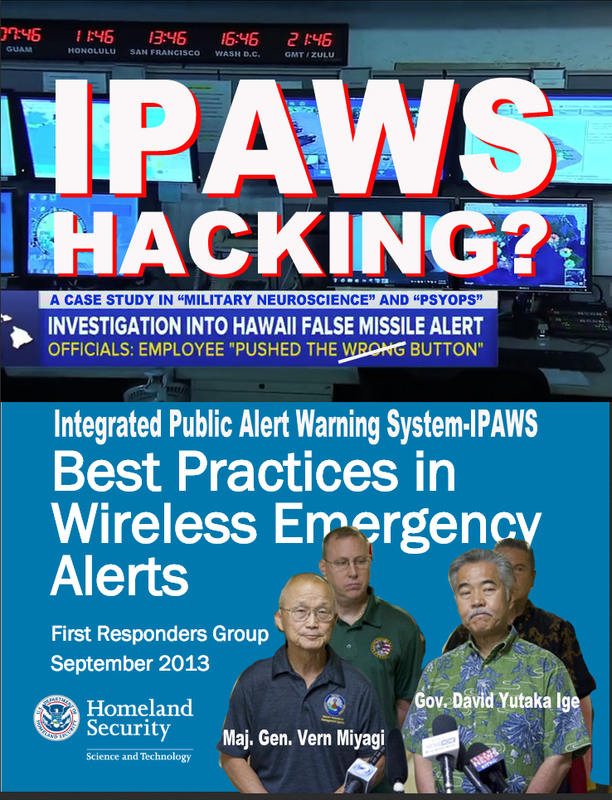 The so-called “Open Platform for Emergency Networks (IPAWS-OPEN) DHS/FEMA/PIA-046 July 17, 2017, expressly authorized Hawaii officials to immediately retract the alert. Miyagi added more irony during his “Nuclear Preparedness” slide presentation. He said “You have to know what to expect and what to do.” Myagi said the same thing during the first press conference. He said everyone is to plan ahead of time what to do. 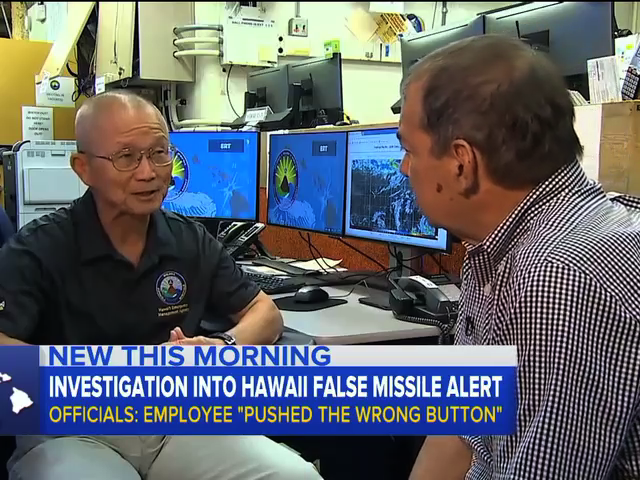 In other words, U.S. Army Retired Maj. General, Vern Miyagi, Hawaii’s Emergency Management Agency (“EMA”) Administrator is not solely liable supervisor responsible for the unnamed “fall ‘guy’s'” “mistake,” nor is Governor Ige is where the buck stops. But new evidence from procedural manuals and FEMA licensing requirements show FEMA’s top officials. (5) The Orchestrated Administration of False Messages by State and Federal Officials, Coupled with the Media’s Silence and Negligence Concerning Clear and Present Security Industry Conflicting Interests, Related and Obvious Political Overtones, and General Neglect of Public Duties Depriving People of their Rights Under the First Amendment, Compound Evidence of Sabotage. Additional evidence of an orchestrated PSYOPS triggered by the proposed sabotage includes the false context of the crisis. Supposedly, the missile was incoming from China’s ally, North Korea. And Miyagi urged citizens to keep up with current political events unfolding in that region. But everyone neglected the “elephant under the carpet.” Korea nuking Oahu China’s would have grossly negative consequences on Korea, and great incentive to nuke especially Honolulu where Chinese industrialists have heavily invested during the past decade. Nor did Miyagi and Logan know why some loud alarms went off in some communities, but others not. “They are separate systems,” Miyagi admitted. And that admission gave more cause to realize a coordinated covert operation was being administered by a powerful federal agency beyond Miyagi’s knowledge. Compounding this evidence of coordinated Deep State cyber-crime, Miyagi also admitted that certain cell phone companies broadcast the warning while others did not. Only federal intelligence agencies and hacking experts have the power to automatically trigger some wireless companies, but not others, to broadcast phone alerts. Hawaii’s state police and civil defense officials lack this capability. Certainly, the single “guy” was not the only responsible party. The North American Aerospace Defense Command (NORAD) must have known about this horrible mistake by 8:08AM. Their officials have cell phones, and they are supposed to be in steady contact with Hickam Air Force Base at Pearl Harbor. That Joint Base Pearl Harbor–Hickam organization serves the Pacific Air Forces (PACAF) that load planes with nuclear bombs that are supposed to be airborne within a few minutes of an alert coordinated with the Strategic Air Command (SAC). On several occasions during the 1970s and 80s these groups made mistakes administering false alarms. Surely by 2018 they would have nearly instant access to false alarm correction systems linking federal and state emergency response personnel and their communications systems. Why did it take these forces nearly an hour to respond? Likewise with the Federal Emergency Management Agency, FEMA. So the official excuse–the single “guy” at the switch–seems ridiculous, outrageous, certainly unreasonable, especially when compared with the social PSYOPS thesis and the news media’s abuse of the public for months prior to this event. As the unprecedented Star Advertiser image shown below evidences, covert interests launched this attack against peaceful enjoyment of life and property in Hawaii months ago. Alternatively, if we accept the excuse that the “well-trained” warning official made a mistake, it shows the State of Hawaii hires gross incompetents to receive training, to push the government’s most important buttons. We’d have to accept how dysfunctional our civil defense and governmental security systems are in the wake of a ballistic missile threat. We would thus be appalled at the notion of nuclear annihilation and protest widely. If we accept the official story, it shows how taxpayers have been defrauded into believing our security systems are viable. 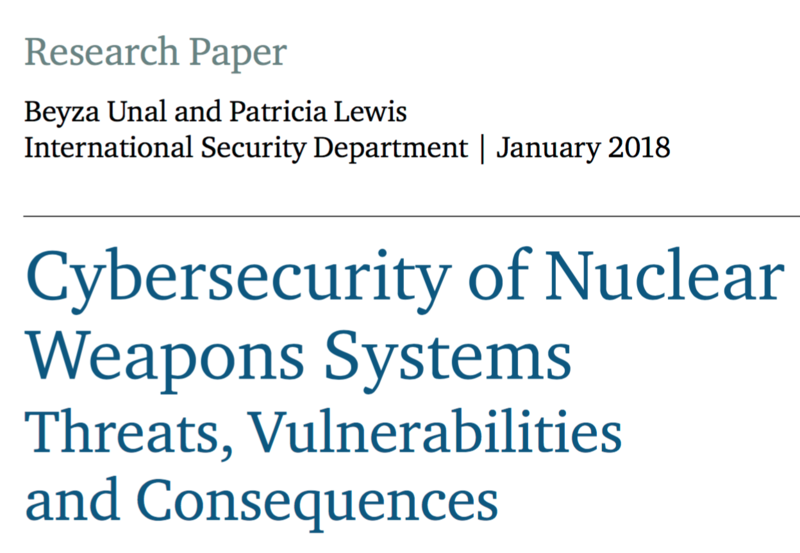 It shows how vulnerable we are to those on government payrolls administering “preparedness” and “defense strategies.” It shows the most advanced technologies and communications systems are susceptible to human errors. And it shows we are not protected from ego-maniacs in politics targeting any city with a nuclear bomb. It shows that all nuclear weapons MUST be banned immediately by every nation in accordance with World Beyond War justifications and common sense. But since little of the above showings are politically correct or admitted by Gov. Ige’s administrators, the other conclusion is most reasonable. That is, SABOTAGE, cyber-crime, and PSYOPS. The Hawaii Nuclear Ballistic PSYOPS of 2018 evidences the most advanced progress in achieving this National Purpose. 76) Fritz, J. (2009), Hacking Nuclear Command and Control, Canberra: International Commission on Nuclear Non-proliferation and Disarmament, http://www.icnnd.org/Documents/Jason_Fritz_Hacking_NC2.pdf (accessed 1 Dec. 2017). 77) Mordechai, G., Kedma, G., Kachlon, A. and Elovici, Y. (2014), ‘Air-Hopper: Bridging the Air-Gap between Isolated Networks and Mobile Phones Using Radio Frequencies’, 9th IEEE International Conference on Malicious and Unwanted Software (MALCON 2014), pp. 58–67, doi: 10.1109/MALWARE.2014.6999418. 78) Ben-Gurion University of the Negev (2016), ‘Cyber Security Researchers Find Another Way to Hack an Air-Gapped Computer Through the Machine’s Cooling Fans’, 30 June 2016, http://in.bgu.ac.il/en/Pages/news/hack_fan.aspx (accessed 1 Dec. 2017). 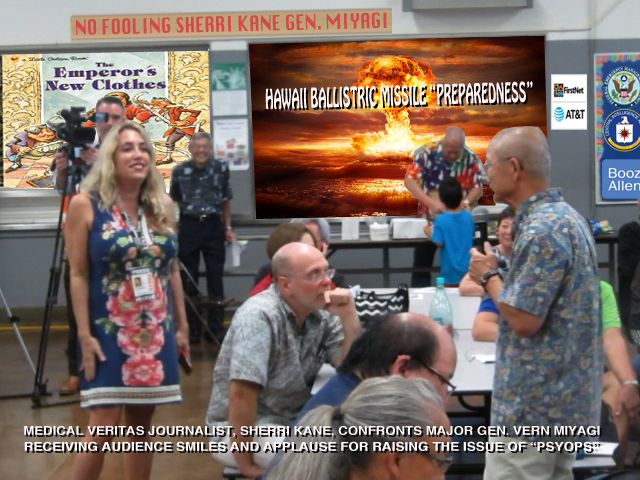 (2) In an article titled, “What You Should Know About Hawaii’s Ballistic Missile False Alarm, According To A Former Navy Emergency Manager,” Shawn VanDiver–a 12-year Navy veteran and university instructor, identified Governor Ige’s false statements. Accordingly, we know that someone, more likely two people, in Hawaii’s EMA at the helm during the “shift change” would have needed to think about whether or not they really wanted to broadcast that message over the select wireless services linked into the system. So this wasn’t simply one mistake made by one person. Concurring, MR. JUSTICE BLACK, with whom MR. JUSTICE DOUGLAS joined the verdict to secure “freedom to discuss public affairs and public officials [a]s unquestionably, as the Court today holds, the kind of speech the First Amendment was primarily designed to keep within the area of free discussion. To punish the exercise of this right to discuss public affairs or to penalize it through libel judgments is to abridge or shut off discussion of the very kind most needed. This Nation, I suspect, can live in peace without libel suits based on public discussions of public affairs and public officials. But I doubt that a country can live in freedom where its people can be made to suffer physically or financially for criticizing their government, its actions, or its officials. “For a representative democracy ceases to exist the moment that the public functionaries are by any means absolved from their responsibility to their constituents; and this happens whenever the constituent can be restrained in any manner from speaking, writing, or publishing his opinions upon any public measure, or upon the conduct of those who may advise or execute it.” An unconditional right to say what one pleases about public affairs is what I consider to be the minimum guarantee of the First Amendment. In Farmer v. Brennan, 511 US 825 – Supreme Court 1994, the fact finders addressed “the level of culpability deliberate indifference entails” versus “recklessness.” “The civil law generally calls a person reckless who acts or (if the person has a duty to act) fails to act in the face of an unjustifiably high risk of harm that is either known or so obvious that it should be known. . . . The criminal law, however, generally permits a finding of recklessness only when a person disregards a risk of harm of which he is aware. . . . In Canton, interpreting Rev. Stat. § 1979, 42 U. S. C. § 1983, we held that a municipality can be liable for failure to train its employees when the municipality’s failure shows “a deliberate indifference to the rights of its inhabitants.” . . . In speaking to the meaning of the term, we said that “it may happen that in light of the duties assigned to specific officers or employees the need for more or different training is so obvious, and the inadequacy so likely to result in the violation of constitutional rights, that the policymakers of the city can reasonably be said to have been deliberately indifferent to the need.” Id. , at 390; see also id. 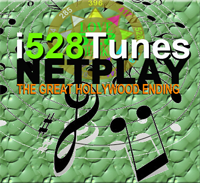 , at 390, n. 10 (elaborating). On July 11, 2011 the group Anonymous, as part of its Operation AntiSec, hacked into Booz Allen servers, extracting e-mails and non-salted passwords from the U.S. military. It has been reported that HBGary Federal was contracted by the US government to develop “astroturfing software” which could create an “army” of multiple fake social media profiles to overwhelm opposition groups and make it appear that the hackers’ political position is favored by most citizens. This wire fraud seriously damages society’s integrity and legislative decision-making. Later it was reported that while data security firm HBGary Federal was among the “Persona Management Software” contract’s bidders listed on a government website, the job was ultimately awarded to a firm that did not appear on the FedBizOpps.gov page of interested vendors. “This contract was awarded to a firm called Ntrepid,” Speaks wrote to Raw Story. 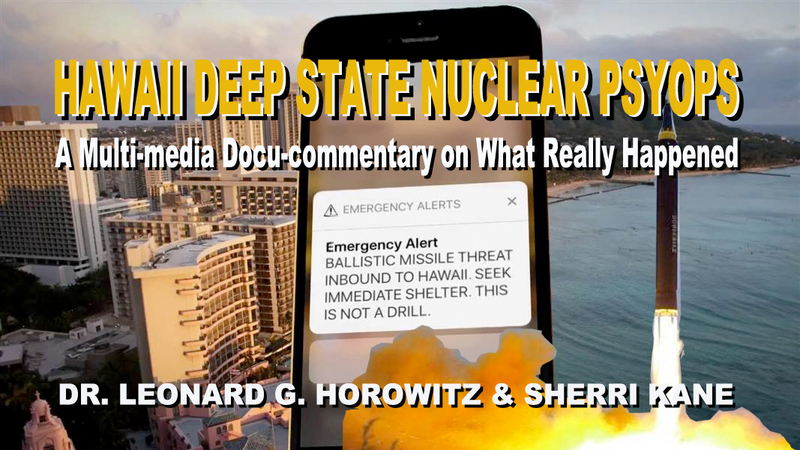 38 Minutes of Hell: The Hawaii Ballistic Missile Crisis of January 13, 2018. CLICK here to download a copy of The Las Vegas Deep State Massacre for only a $3.93 donation to the non-profit publisher, Medical Veritas International, Inc.